Can you see it? 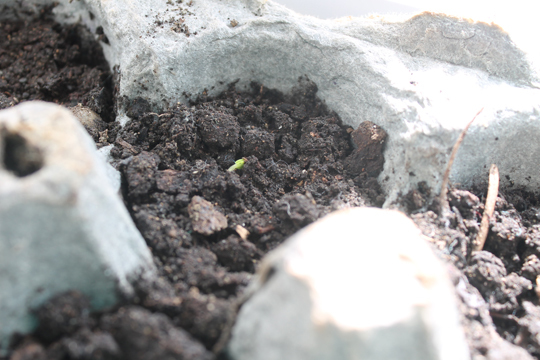 There in the middle of the egg carton...a tiny, tiny seedling just pushing through the soil. Victory! I decided to try and start lavender from seed. It is supposed to be super finicky and better started from cuttings. But one packet of seeds, soil from the backyard, 1 night in the freezer, and 2 weeks later...there is one victor. I had very low hopes that they would take, and am still not holding my breathe. But if I can get even one seedling, it will be success!! My gardening skills have been slowing growing each year. I've been lucky enough to have stayed in rentals that all have 1. garden spaces or 2. landlords who don't mind. Our latest place (1 year in May) has a little front "yard" full of dead ground-cover. So I've been working up a little potager garden plan. Something with perennials, annual vegetables, and green year round for the tenants after we move. My successes with growing from seeds have been with plants that grow well in the PNW. Zucchini, bush beans, strawberry, thyme, mint, oregano, violets, and garbanzo beans. This year I'm trying lavender, chile peppers, banana peppers, lemon balm, bush beans, bachelor buttons, nasturtiums, chamomile, cilantro, echinacea and red yarrow. I know that a few are practically guaranteed to do well...like bush beans, lemon balm, nasturtiums, and red yarrow. Friends have had success with chiles and banana peppers so I'm thinking they have a good chance. Cheers to the start of a new growing season. Good for you. Just a warning - my mom brought me a couple of planters one year and eventually I dug up the whole from area and filled it with flowers (and a veggie here and there)! It is so much fun! I love seeing the flowers and veggies and watching them grow. We'll see how it goes this year with James stomping around...I'm staying hopeful.